"Being at the western fringe of Europe, Iberia had a peculiar prehistory and a complex pattern of Neolithization. A few studies, all based on modern populations, reported the presence of DNA of likely African origin in this region, generally concluding it was the result of recent gene flow, probably during the Islamic period. Here, we provide evidence of much older gene flow from Africa to Iberia by sequencing whole genomes from four human remains from northern Portugal and southern Spain dated around 4000 years BP (from the Middle Neolithic to the Bronze Age). We found one of them to carry an unequivocal sub-Saharan mitogenome of most probably West or West-Central African origin, to our knowledge never reported before in prehistoric remains outside Africa. 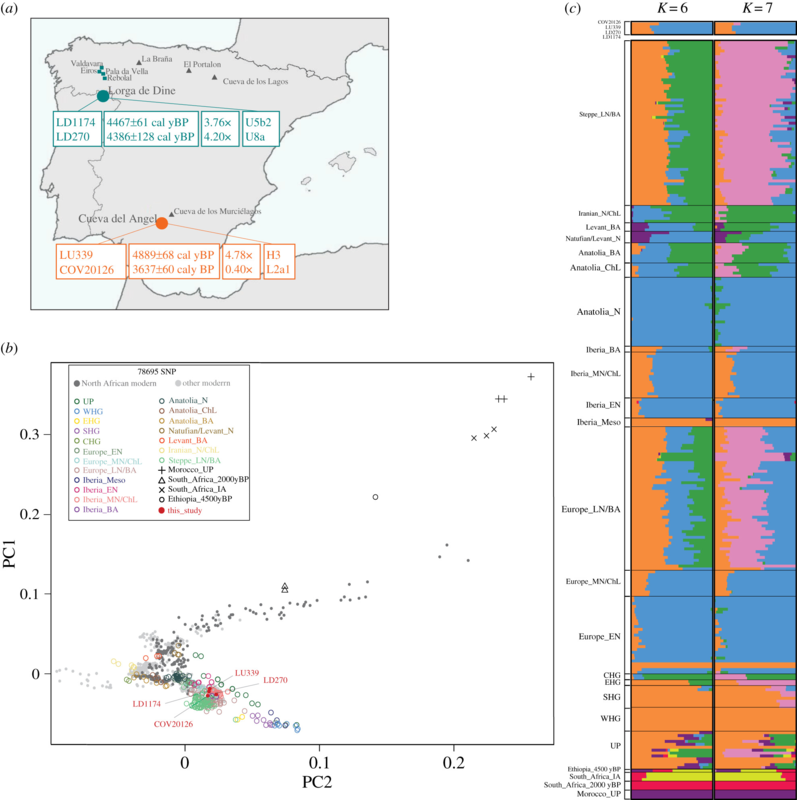 Our analyses of ancient nuclear genomes show small but significant levels of sub-Saharan African affinity in several ancient Iberian samples, which indicates that what we detected was not an occasional individual phenomenon, but an admixture event recognizable at the population level. We interpret this result as evidence of an early migration process from Africa into the Iberian Peninsula through a western route, possibly across the Strait of Gibraltar." If correct, it means that once again the programs purporting to date admixture seem to pick up only the most recent event. yes, very interesting, now as the steppe autosomal in COV20126 is linked to African mt DNA I must admit that the steppe theory is right... only to change the Pontic steppe by the Sahel one! There is no "steppe" in that sample: it's typical Iberian Middle Neolithic/Chalcolithic. The WHG (orange) and Anatolian Neolithic (blue) are the major genome components in all our four Iberian samples, although at K = 7, a component (pink) associated with the Russian Steppes, is already visible in COV20126. What do you mean, I swear BB has CHG, and CWC definitely has quite a lot of it. Is that what this paper says? None at K6, at K7 the tiniest smidgeon of "steppe". All as expected I would say...a late, gradual entrance into Iberia. It doesn't matter whether it's a big lab or a small one, international/American, or Spanish. The narrative is consistent. at K6 the green CHG is present in steppe and CWC, at K7 the green which is 2/3 in CHG disappears in such pops, weird, but to me ok as it goes for my first bet about IE from Kievan Rus. if you accept K7 then you must accept that Iran Neolithic and Anatolia Chalco had already been invaded by Yamnayans before they popped up in the steppes... weird again? I must be blind but where exactly this sentence " Our analyses of ancient nuclear genomes show small but significant levels of sub-Saharan African affinity in several ancient Iberian samples, which indicates that what we detected was not an occasional individual phenomenon, but an admixture event recognizable at the population level. " Is shown into the admixture chart? Even as they dont find SSA admixture in the individual with African mtDNA they downgrade other samples till get such admixture... but the guy is so problematic that he dont display it even so. For these programs I'm getting the impression that behave like the best Marx bro. And do we know what kind of sub-saharian ancestry did they found, what was the prehistoric proxy for it Mota, Nachikufu? Or is it modern SSA ancestry? Also why they express specifically an emphasis on SSA ancestry and not African one in general? Hard time to imagine that individual in prehistoric Spain with SSA ancestry, didn't have North African ancestry too no? SSA proxies were ancient South Africans: Ballito Bay (Khoisan) and Iron Age (Bantu), both gave (barely) significant D stats. how old is the Ballito Bay (Khoisan)? were they herders or HG? Ted Kandell is met Max De Plum en 3 anderen. Yes the Malawi HG is Nachikufu. But there is something i dont really understand " An alternative possibility is that gene flow may have occurred even earlier in Southern Iberia from a population with Sub-Saharan African features, which left some genetic contribution in the genomes of the people, the local hunter–gatherers, they admixed with " I'm not sure how prehistoric Iberians and prehistoric Sub-Saharian Africans are supposed to have mixed without Iberomaurusian-related ancestry being more dominant than the Sub-Saharian One. Also the mtdna L2a1 shows no SSA ancestry at all, wich could mean that the lineage was at the time enough old in that place to have her SSA ancestry diluted into Neolithic ones. It's then possible that the SSA ancestry was related with a North African ancestry older than Iberomaurusians and more close to SSA, less Basal Eurasian. Yeah, it's weird. L2a1 and L1b are clear enough indicators, but the D stat signal is pretty marginal, should we be sure it's even real? Seems like it wouldn't take much of undetected artifact somewhere to throw them off. In general f stats involving Africans are hard to interpret, and I'll be surprised if the real population history isn't way more complicated than any qpGraph yet attempted. Prior to Iberomaurisian there was Aterian, which descended from the archaic Jebel Irhoud population (315 ka), so not the SSA. If SSA entered Iberia, these people must have crossed Iberomaurisian territory prior to that. Hard to interpret in what way?